Which installer do I need? 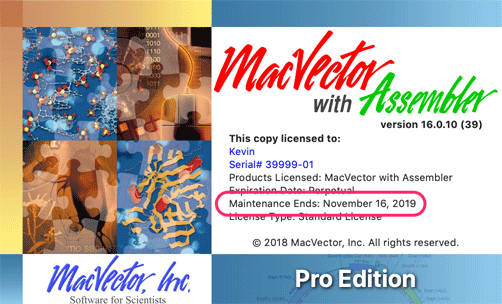 Typically, the maintenance end date is set to 12 months after the last time that you or your institution last purchased MacVector, an upgrade, or renewed a yearly maintenance contract. If you believe the displayed date is incorrect, please check that you entered the most recent activation code sent from support@macvector.com. These releases will only run on very old operating systems and hardware. They require the old purple USB hardware dongles to run. It is unlikely you will ever need to download and install these unless you have some very specific requirements and have discussed your needs with MacVector Support personnel.